One of my best friends, Jennifer Hostetler, ALWAYS comes up with amazing ideas for a theme party. This year, for her daughter’s first birthday, she decided to do a Circus theme. 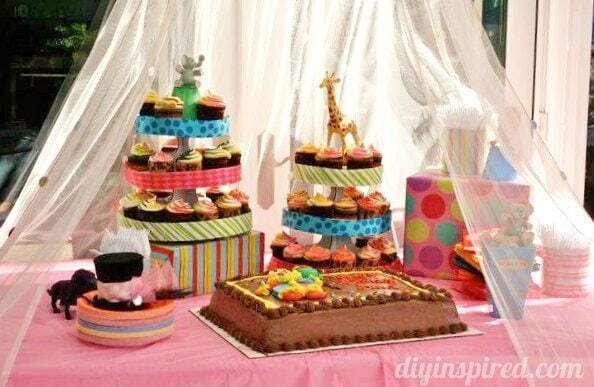 With a little do it yourself creativity and a lot of imagination, Jennifer hosted a fabulous party on a budget. 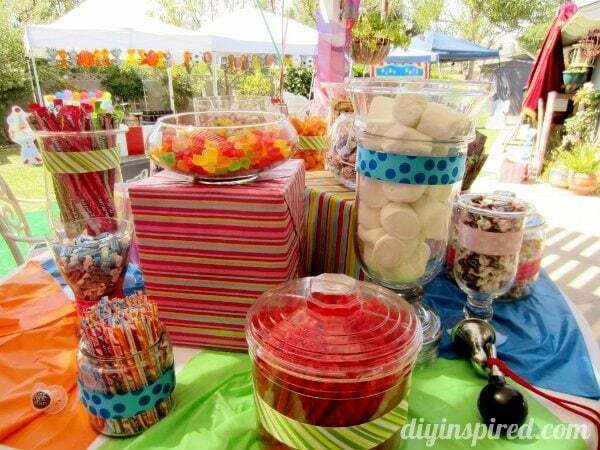 Carnival theme or circus theme parties are great party theme ideas. If you read this blog, you KNOW what a HUGE fan I am of dollar bin decorating, especially for a kid’s theme party. 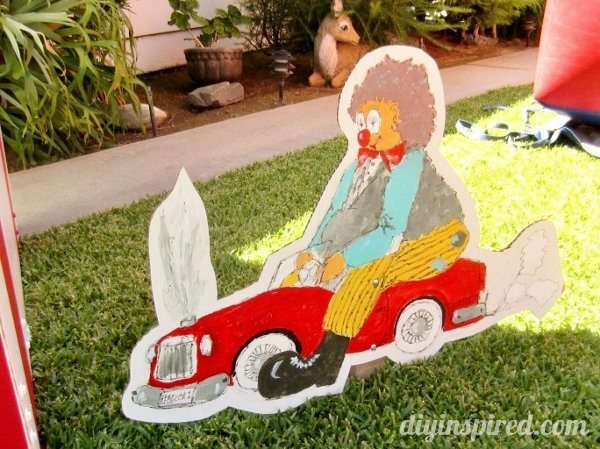 Jennifer found these great circus themed pieces for the centerpieces. 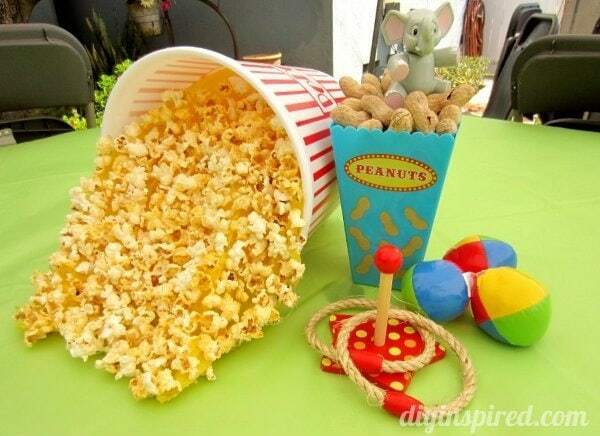 She took it one step further and glued popcorn and peanuts with spray adhesive to give them a more realistic look. I love the way she made them all different. 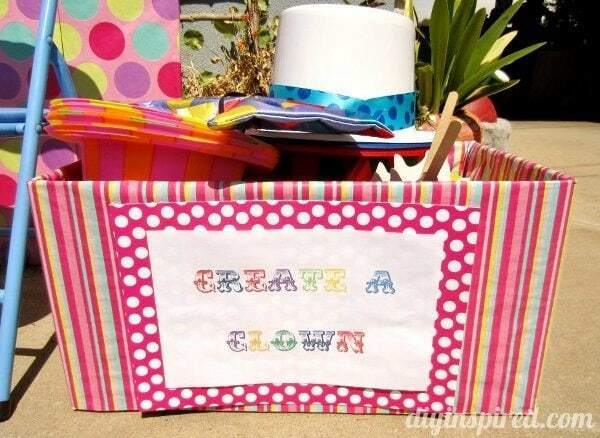 Jennifer came up with these easy and inexpensive party game ideas to fit the carnival theme. 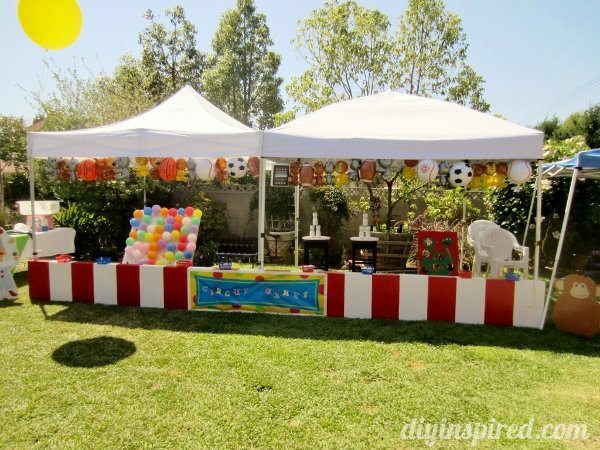 To keep the little guests busy, some of her party games included, a ring toss, baseball toss, and balloon dart throw. 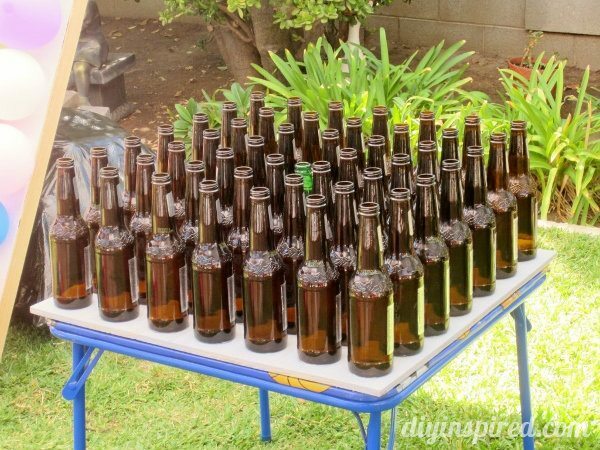 For the ring toss she secured each empty beer bottle with glue onto a square wooden board. I give it two thumbs up just for the beer bottle recycle factor! Jennifer also recycled baby snack containers for the baseball toss by removing the label, painting the can, and weighing them down with pebbles. 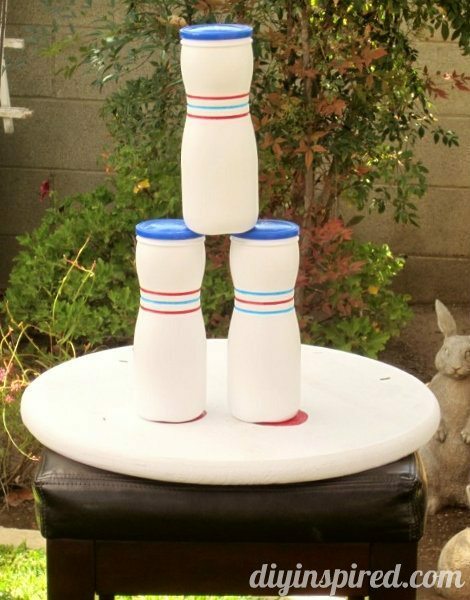 She simply stacked three cans on a bar stool. 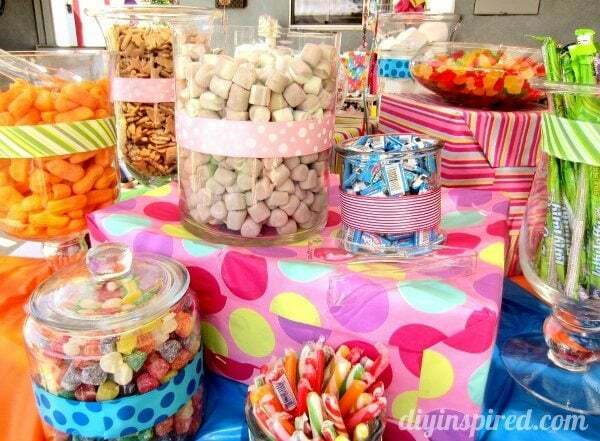 I’ve posted before that a candy dessert table has a trifecta factor. 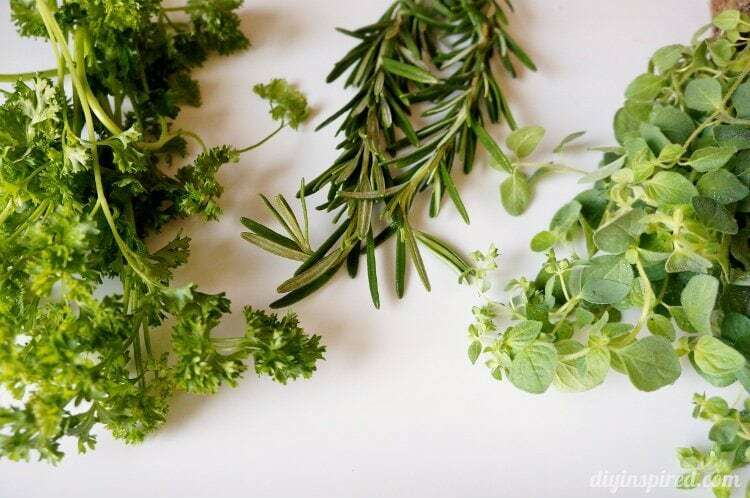 It is beautiful to look at, gives the guests something to do, and is tasty to eat. 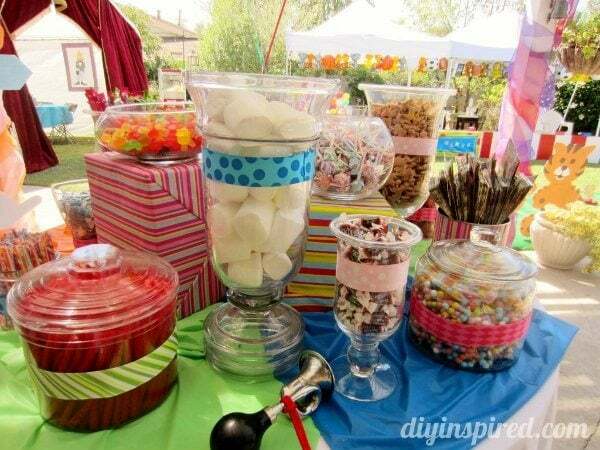 Check out Jennifer’s gorgeous and colorful candy dessert table. She used a round table, which looked beautiful and yummy from all sides. She created height with wrapped boxes and color and pattern with ribbon. One thing about Jennifer is her attention to detail. 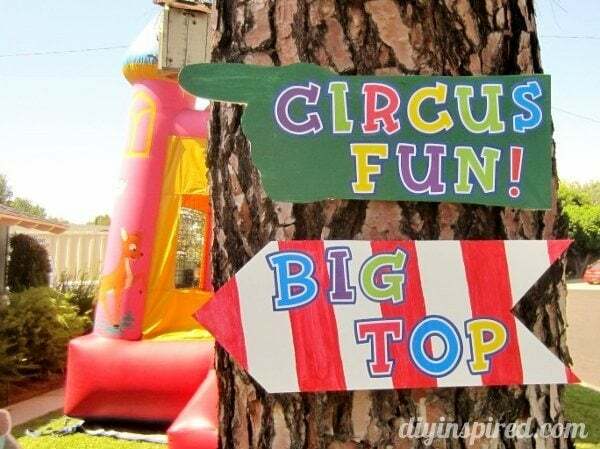 Check out these other great do it yourself decorating ideas for a circus theme party including a photo booth, cake table, and signs. Jennifer is definitely someone who inspires me. I didn’t even post half of the amazing details of this party. Look out for her upcoming budget party blog to see the rest!!! I’ll be the first to let you know when it launches! 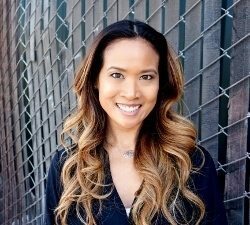 Thank you Jen for the inspiration! Love you! these are great ideas!! what an amazing imagination!! i love it! i want to see the rest!! how do we find the blog????? Hi Veronica! Thank you so much! 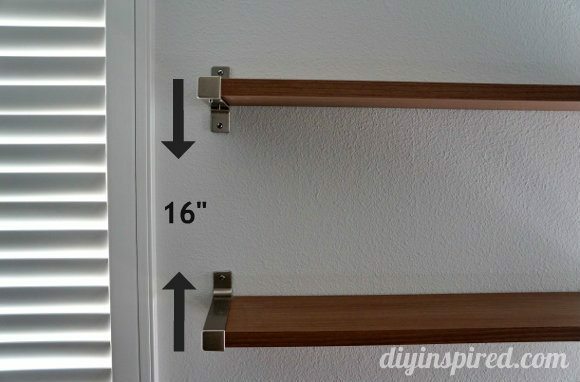 To view the rest, go to the homepage http://www.diyinspired.com. You will see several projects. The rest of the Candyland party is near the bottom. Thanks for visiting!! What a great theme! I think the easiest way to incorporate the Wizard of Oz to a carnival theme is to stick with a color scheme like yellow and emerald green. You can add purple too. 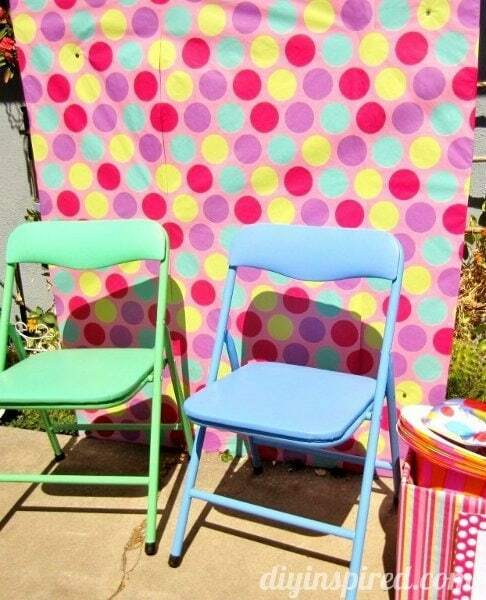 This way you can have all the traditional carnival games, just use the color scheme. Also incorporate the yellow brick road wherever you can! I hope this helps! Are there directions anywhere for the glued popcorn centerpieces? Hi Shereda! The popcorn is attached with spray adhesive. It comes in an aerosol can and you can purchase it at any craft store or online. Let me know if you have any other questions! Thank you so much for stopping by and commenting! Hi Shereda! I was incorrect in my answer to you! I apologize 🙂 I spoke with Jennifer last night and she told me she stuffed yellow tissue paper in the bottom of each bucket. Next, she hot glued each piece of popcorn. She sprayed a clear acylic spray paint on top. Post some pictures on FB if you end up doing it! Our FB page is http://www.facebook.com/diyinspired. How was the carnival game booth done? Is that wood or fabric used? How is the wood and tent leg connected? So it wouldn’t fall. Hi Ray! It’s Plywood and 2 x 4’s cut, painted and screwed together for the booths. There are braces on the back side. Hope this helps! Thanks a lot! 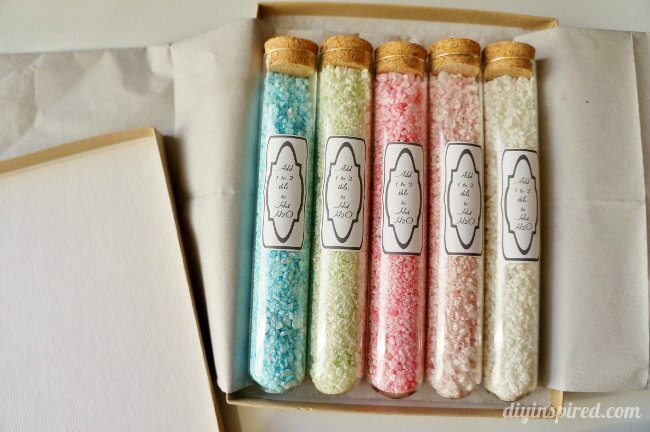 I will attempt to make these, wish me luck! I wanted to know how she did the balloon dart throw for the Carnival Theme or Circus Theme Party. Could you let me know I am planing one as we speak. Hi there! I believe she used plywood for the back and a foam presentation board on top. They used thumb tacks to attach the balloons. I will ask her tomorrow. She is in the hospital and just had her twin baby girls! I’ll get back to you ASAP! OK, I spoke with Jen. Cut plywood to the desired size. Paint it. Frame the back with a 2X4 for a slanted stand. 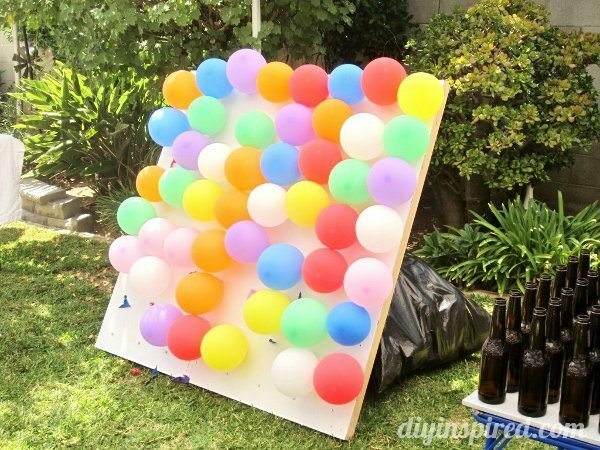 Use push pins, thumb tacks, or drywall nails to attach the balloons, just make sure that there is a large, flat head. 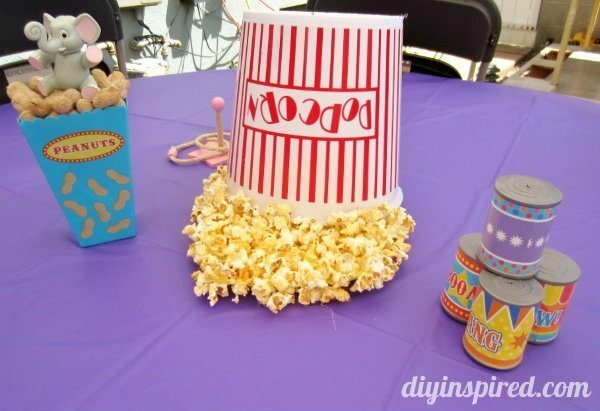 How did you glue the popcorn in the centerpieces? I have the tubs an wanted to do this but didn’t know how I would yet. Never mind 😉 lol. I read above. That’s actually the only way I could think of dining it. Good to know about the clear spray paint though. I love the centerpieces, actually I love everything. 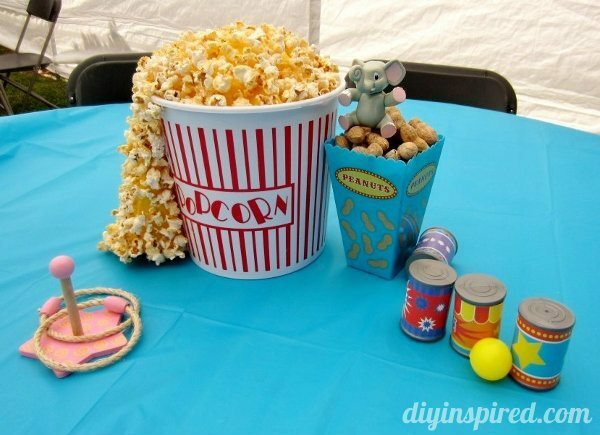 I am trying to figure out how you glued the popcorn to give it the realistic look. You are amazing continue to be creative. Where did you find those great peanut boxes? I’d love to find to find something like those. Too cute! They were in the Target dollar bin years ago!